Forest fires in Chile ravaged vast swathes of land this year, leaving patches once thick with sturdy old trees reduced to burnt landscapes. Now, three plucky dogs are helping replant it all. The blazes blackened the El Maule region of central Chile as part of a series of fires that claimed 11 lives and charred a total of 457,000 hectares. 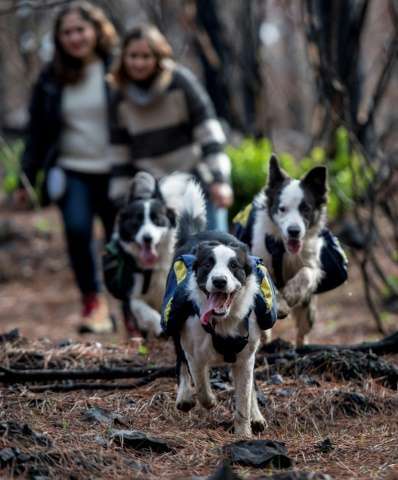 But since March three Border Collies have been scampering through the charred remains with special satchels that spread seeds as they run to sow seedlings, grass and flowers. A major goal is for animals that fled the fires to come back. "The main thing is for the fauna to be able to live," said Francisca Torres, the owner of the three dogs tasked with this big mission. The female dogs are named Das, Olivia, and Summer. They jump out of Torres' truck and run into the forest they are charged with bringing back to life by spreading seeds from the satchels, happily oblivious to the benefit they are providing. When the job is finished they get treats from Torres, 32, who also trains dogs to work with people with disabilities. Then she fills their satchels up with more seeds and sends them out again. Torres, who runs an environmental NGO, says these dogs—bred to herd sheep—are smart, vibrant and fast and therefore just right for the job. In any case, they are better than humans, she said. The dogs can cover a range of 30 kilometers in a day and sow up to 10 kilos of seeds, whereas a person could only do three kilometers in a day. This work has been under way for three months now in 15 forests of the El Maule region. In some of them, grass is back and seedlings, vines and mushrooms have pushed through the blackened earth, thanks to the moisture that comes with the winter of the southern hemisphere. "We have seen some fields that are now totally green thanks to the work of Summer, Olivia and Das," said Torres. She pays for this work largely out of her own pocket, and with some donations. Torres expressed hope that this summer the seeds will have germinated and some animals like foxes, hares and lizards will have returned to the forest. I've done tree planting before in cleared and burnt forests. Burned is not so bad, but cleared forests are a total mess. The ground level in such areas is invariably ....hopelessly impenetrable for humans. There is no way for humans or human machinery to move across or though it, with any effectiveness or alacrity or any other word you may chose. The dogs can do so. easily. Therefore--it is the dog as the method and obvious choice.